The event will feature community resources, food vendors and entertainment by DJ Battlecat, Gospel Choirs and much more! The event serves as a fundraiser for PCI’s Youth Leadership Program, Feed LA, Jobs & Education Center and PCI’s Community Events. Sponsor and vendor opportunities still available! Visit the link below. P.C.I. is a 501(c) 3 non-profit organization. Your Tickets, Sponsorships and Donations are TAX DEDUCTIBLE. This year’s theme is: “Prospering the Community Through Unity”, will highlight community resources that assist in building wealth and incorporate the goals of First Lady Michelle Obama “Let’s Move” Campaign towards a healthier lifestyle. The event is also designed to promote unity and peace in the communities of Athens/Willowbrook and surrounding neighborhoods. The activities schedule will encourage community collaborations, reiterate the importance of education to local area youth and increase awareness of health issues plaguing our communities. LAUSD Board Member George McKenna will serve as Grand Marshall. Additional guests include: Congresswoman Maxine Waters (43rd Congressional District), State Assembly member Mike Gipson (64th Assembly District), Mark Ridley Thomas (L.A. County Supervisor), Jim McDonnel (LA County Sheriff). P.C.I. 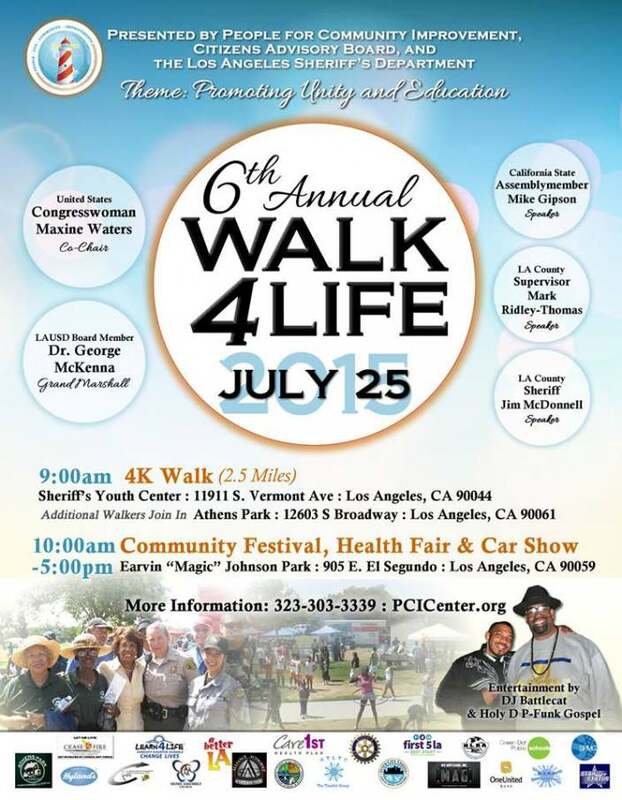 wants to thank its Community Partners and Sponsors: A Better Life LA, Rotary International, Los Angeles County Sheriff’s Department, Los Angeles Police Department, One United Bank, Care First Health Plan, SEIU Local 721, West Los Angeles Community Development Corporation, Green Dot Public Schools, Hyland’s, Home Assembly Church, UPS, Fair Chance Project and FrontPage with Dominique DiPrima.